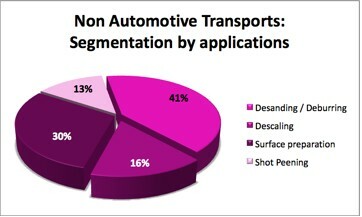 The non-road transportation market represents 10% of the worldwide abrasives market. Steel abrasives play a key role in the production of numerous parts for the aeronautics industry, railway construction or shipyards. Need for better surface preparation before coating, painting and metallizing. Our blasting solutions and products take into consideration all these requirements. We offer solutions for aeronautics, shipyards and railway construction with the creation of dedicated products. For example, ProWheelium is a high performance alternative to hard steel grit in wheelblasting operations.